The CRP123 Premium possesses all the standard features that an OBD oriented scanning tool must have. Beside, it has many additional features that are unique to this particular device only. This auto diagnostic instrument is manufactured with a strong and sturdy plastic case. The plastic is highly durable and non-breakable that can tolerate heavy jerks. Even if the device falls on the ground, the plastic is capable enough to absorb the hitting and the internal mechanism remains unaffected. The screen is made up of anti-tempered glass. You might rarely experience even a scratch on the screen, let alone it getting tempered. In short, the device is suitable for virtually any rough and tough usage. LaunchTech has a visually pleasing compact design. It looks more like a video-game gadget. It’s an easy to carry device that fits in the pocket, sits on the palm or can be placed in the car perfectly. The device with it’s cherry and black color combination is visually appealing. I must say that it has a tempting design like a hand-held video game device. The navigational buttons, that are self explanatory, are set nicely on the right side. Its overall look makes it appear as …. if you’ve handled a sci-fi gadget you’d understand what I’m talking about. 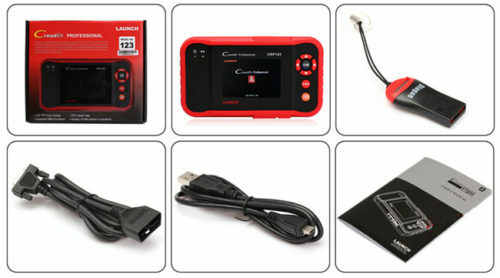 You can’t count Launch Tech creader profeswsional crp123 auto code scanner to be like any of the other OBD scanners. Although OBD-II is a standard yet different manufacturers use different On-Board-Diagnostic Modes. With it’s latest OBD-II version 6 diagnostics technology, it can read all the 10 modes of OBD. What that means? You can use the device, literally, with any OBD enabled vehicle. As soon as, the scanner is attached to the OBD-II port of the vehicle, it can fetch and present the live diagnostic data. Although, the data is presented in an intuitive manner and immediately informs you of the problem in the vehicle yet you can save and export the data for later use. This function comes handy if you want deeper analysis using vehicle diagnostic apps like DashControl or TorquePro. The engine scan history can be retrieved anytime in the nearest future unless you manually delete such information. This is not a typical Launch X431 diagnostic scanner but a CAN enabled device as well. That means, it enables you to find malfunctions in engine mechanism but also enables you to find if there is any trouble with ABS, SRS, EPS or Transmission System of the vehicle. In reference to this, the tool is also appropriate for all US motor vehicles as well as diverse range of automobiles that are manufactured from Asia and Europe. The screen area occupies the total surface area of the device, thus, making the code reading an “easy-cheesy” task. The vehicle diagnostic codes related to the engine, Anti-Brake Lock System (ABS), Safety Restraint System (SRS), Transmission or EPS are displayed as an alpha-numeric value. A small snippet also appears along with the alpha-numeric code describing the problem in a simple (layman) language so that you don’t have to go searching for the meaning of it from a code manual. You need to check the manual only where you want a thorough expatiation of the problem. After a little experience, I doubt you will ever need the manual as the snippet will be enough to understand the trouble. Additionally, If any problem is found, the scanner beeps and an illumination light turns on to direct your attention to the issue. In particular, the dimensions of the product makes it portable enough with its 9.2 inches in length, 7.8 inches in breadth and 1.7 inches in height. The screen area occupies the majority of the space so as to display data that is easy to read. The overall weight of the device grosses 1.4 pounds. All these features make it an easy to carry product. Although the device comes with a CD but you might never need to use it. It’s like a plug and play device and doesn’t require any software to run. All it requires is connecting it with the Port using the 16 pin connector chord that comes with it. As soon as it’s connected, it starts diagnosing the vehicle engine when you tell it to do so by touching the right buttons displayed on the screen. The company provides an excellent after-sales service. If you face any trouble using the device or it’s not working as it should be, just raise a ticket on the manufacturer’s official website and a qualified technician would attend you. Launch tech releases Code-Updates from time to time. Just attach the device with a PC and run the updater that you will find in the CD. Within a few minutes the code library of the device is updated and you can use it with the latest vehicles. You don’t have to buy an additional scanner for the newly launched automobile. The device is intended for intermediate and advanced enthusiasts. It is designed for auto mechanics and also for car repairing shops owners. And if one can afford it, why not? As well as normal people. Because it was designed for professionals in mind, the quality standards are very high. That’s the reason the tool might appear to be a bit over-priced and may seem un-affordable. But it’s a real value for money piece of garage arsenal. The product is for anyone who wants a handy device for a timely monitoring of his/her OBD2 Scanner vehicle and want to avoid any major engine issues. , PLZ go to mycar.x431.com this website to register your Launch CRP123 on line, on the top of right corner of website, PLZ choose register then input all information following the indicate, after you fill all information in the page, then you finish register. 2. you go back the first page of mycar.x431 website, then choose login, input your using name and password informtion, now you need to register CRP123 this product, now page will ask you to input the product model and serial number and register code, because global Launch CReader Professional CRP123 version without area limited, so it doest need delear code, you can find the register code in our CPR123, after you turn on your CRP123, you can see there has help in our display, choose that, then choose the equipment inforamtion, then you can see the registered code. Now input the registered code in the website, now you completed all the register. 3., you can download the software from website, after you go into download center, firslty you must download the udpate tool named in DBSCAR_SERIES_UPDATE into your computer and install it in our computer, now you can download the software that you need from website, then update the software through udpated tool into your TF card!